Guinea braced Monday for a general strike by unions and a complete shutdown of economic activity demanded by the country's opposition after disputed local elections. An on-off teachers' strike that has paralysed the education system also restarted two weeks ago and shows no signs of stopping. Now the powerful Guinea General Union of Workers (UGTG) has joined the movement by teachers and opposition figures by calling for workers to stay at home on Monday. The union has cited the mismanagement of the national social security system, poor regulation of subcontracted jobs and a perceived indifference to workplace accidents and arbitrary firings for the strike. The UGTG has called on public and private sector employees alike to boycott their workplaces. 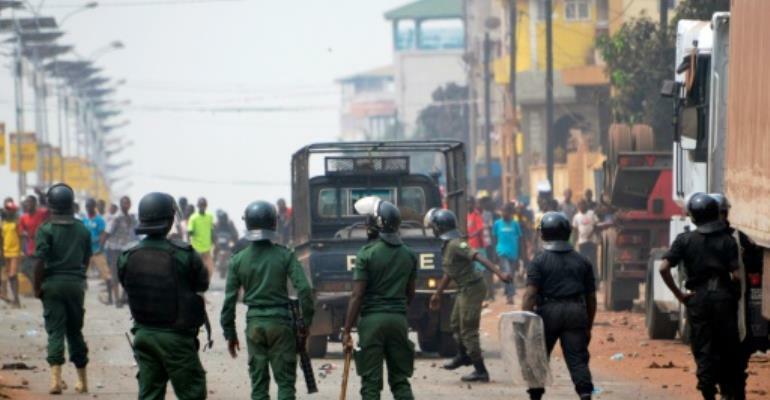 Former prime minister Cellou Dalein Diallo's Union of Democratic Forces of Guinea (UFDG) has meanwhile called for a "ville morte" or "dead city" protest, demanding that all economic activity cease and people stay inside. The party has condemned what it terms "massive fraud" during voting, leading to unrest and the deaths of at least 10 people. "We want the truth out of the ballot box, nothing more," the party said in a statement on Friday, calling for the "real results" to be published". Guinea's education ministry said "all measures have been taken to make schools secure so that classes can take place in the best possible conditions," following protests near some establishments by disgruntled students. "For as long as the 40 percent (increase) with back pay is unpaid... we will not be going back to school," the teachers' unions said Saturday. "Even we are sick of ourselves," following weeks of strikes, admitted teacher union spokesman Oumar Tounkara, but added: "We cannot prepare the future of our students while forgetting our present."